comfort food | I Am Not A Restaurant! In my house we call it zesty zoup, not necessarily because it's zesty (although it can be) but because we like saying zesty zoup. This vegan big batch recipe is a late summer staple. Mid winter veggies work just as well. The addition of barley gives a whole grain chewiness. Try adding quinoa if you'd prefer a hit of protein instead. Use what veggies you have and feel free to sub. Making soup uses up pieces and bits you would otherwise toss. Feel free to use you processor for slicing, chopping & dicing – no judgement! In large stockpot over medium heat, add 1 tablespoon oil of choice. Cook onions 5-10 minutes until soft. Add garlic for last 2 minutes. Stirring and seasoning with salt & pepper. Add carrots, zucchini, yellow squash & corn. Add barley and toss the whole mess together. Combine with tomatoes & 5 cups of water. Bring to a boil. Lower to simmer and cook 20-30 minutes, until barley is cooked through. Check seasonings. Eat. *note: Zoup can be made zesty with red pepper flakes, fresh herbs or pistou (blended garlic, basil, olive oil). 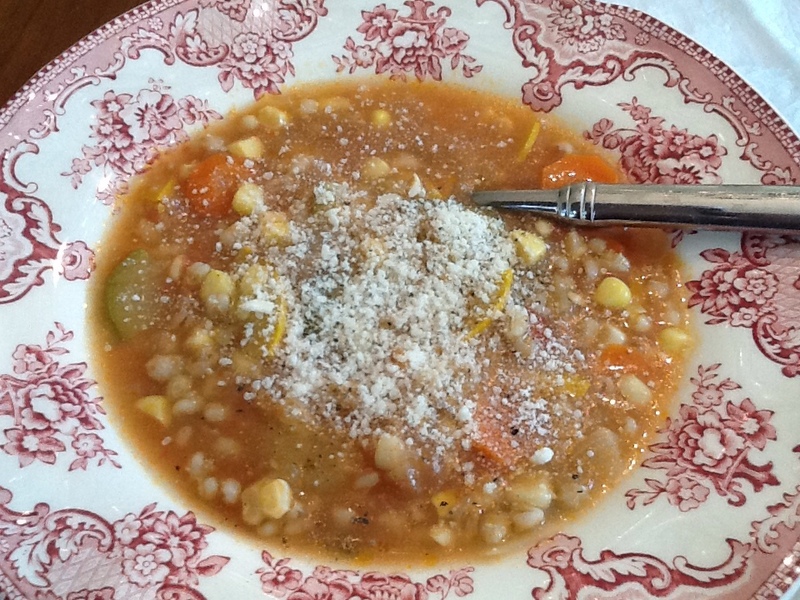 Beans can be added for a heartier dish – jarred, canned or previously hydrated. I may be dating myself, but heck I'm old enough to almost have a teen driver in the house! Remember Name That Tune?Two people ID music, competing to do it in as few notes as possible. That's about how I entertain myself in the kitchen from time to time.There are two versions – making food with as few ingredients as possible, or in as little time. I played both last night which birthed 20 minute tomato soup, paired with grilled cheese. Bonus points for delivering on a much requested teen combo (at least from the teen who eats tomatoes). You will need a Ninja, blender or food processor. Heat oil in heavy stock pot, medium heat. Add onion & garlic, salt & pepper.Sauté 3-5 minutes. Add wine, reduce to almost dry. Skip if you don't have wine. Add tomatoes. Bring to a boil, then simmer 10-15 minutes. Carefully purée in processor, leaving air hole open but blocked with a dishtowel. Add milk. Purée again and keep warm in the pot. Can be decorated with fresh chives, basil or croutons. Make grilled cheese according to preference. Add a salad and you're dinner done! There’s nothing left to say but this…it was going to snow…in March…just days before spring. So I had to make chicken and dumplings. Plus my biggest guy was already sick, meaning I’d already put together chicken soup (possibly my best ever! I used a pre-brined organic chicken. OMG delicious. Thanks Trader Joe’s – you’ve redeemed yourself from the twice bad cream incident.) It's a twist of sorts on the last time I visited this great comfort food with you. Both delicious. Both easy. Here is this week's approach. I had cooked chicken and stock, and every intention of jamming the dish full of vegetables and not so much fat. Veggies are easy, carrots, onions and celery all count towards the daily servings. Don’t be afraid to use the less than perfect specimens from the bin. Like my mom, I throw them in wherever I can. To make a “creamy” sauce sans cream – use vegetable oil, a little flour and flavorful stock. The oil and flour make a roux, the stock sets it into sauce. Works every time. The dumplings are lighter with all purpose white flour, but I subbed cornmeal for some of it. Honestly, even I don’t think it would count as whole grain serving…unless I sold them in the freezer section, with a picture of a field slapped on the box after paying a company to measure the fiber. With chicken that’s already cooked, this dish didn’t take more than 20 minutes to assemble. The next 15 allows the dumplings to rise. Add a tablespoon of oil to heavy bottom pan that has a lid. Melt onion, carrots & celery with a pinch or two of salt over medium heat. Add the thyme. Add ¼ veg oil and whisk/stir in 1/3 cup flour. It will look gloopy, especially with the vegetables already in there. Cook a minute or two, then slowly add stock. I used mine straight from the fridge – I don’t recommend that, I just forgot to take it out. Anyways it still worked. When it starts to bubble and thicken, turn down the heat. Let it cook for 5 or so minutes. Then add chicken and peas. Taste and adjust seasonings. 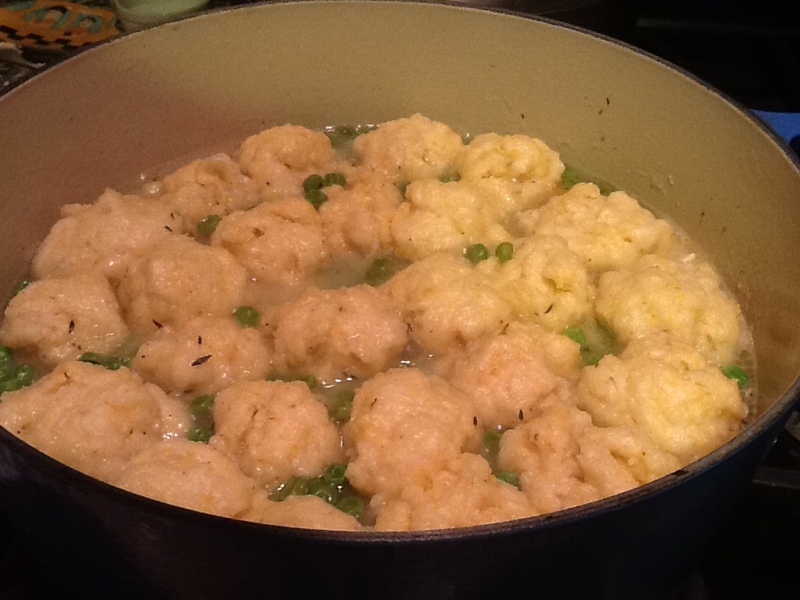 While the stew is cooking, combine the dry ingredients for the dumplings. Add the milk and butter making sure the butter isn’t super hot and the milk isn’t icy cold. 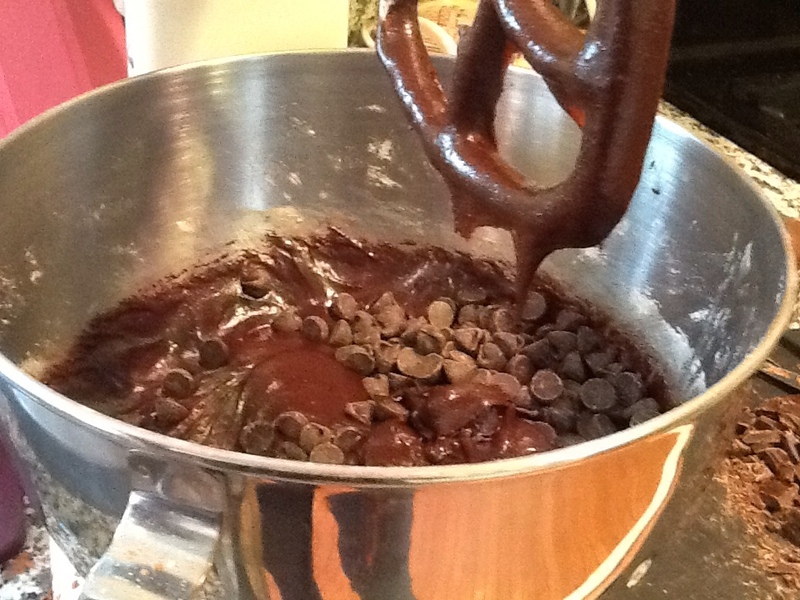 Stir until combined – mine needed a touch more moisture, I chose to delete some flour. Still, the dough should be sticky. 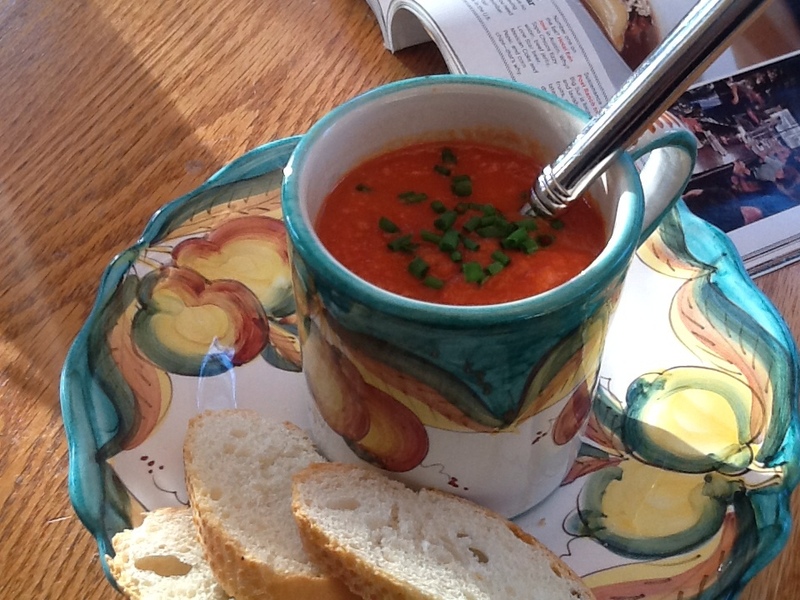 Drop by tablespoon on top of hot stew. Put the lid on it and wait. In 15 minutes – comfort. As the cook, eat a dumpling before the rest of the family to check for “doneness”. BTW – this dish can be kosher! BTW2-if you don’t feel like making dumplings, serve over noodles, with rice or spaetzle or simply cut up 3 large russet potatoes into half inch chunks and add to the pot. For goodness sake, I tried to give you greens (see previous post) y'all only want cookies. Fine! 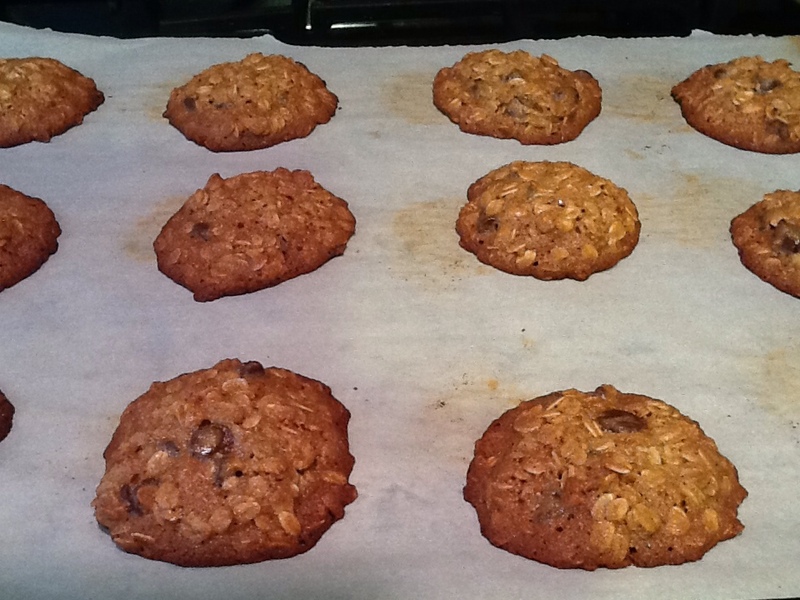 I celebrated the March snowstorm making agave oatmeal chocolate chip. Mostly I wanted to use the agave that was sitting in the pantry for a while. The best way to get inspiration is to try to use up an ingredient. Here's what I learned about agave. It has about the same number of calories as granulated sugar, it's sweeter, so some people use less depending on the usage, and it has a lower glycemic index as measured by the current standard. The recipe is straight from the Dominos website. Cookies are on the sweeter side, especially since I subbed chocolate chips for the raisins. It's still winter…excuse number one. Contractors have finally started to bandaid the damage from my girl Sandy (as in hurricane) and the dog has been vocally enjoying their company. That, combined with whatever they're doing on the roof- Excuse number two. As for number three…ladies, need I be specific?! And that's why today is brownie day. 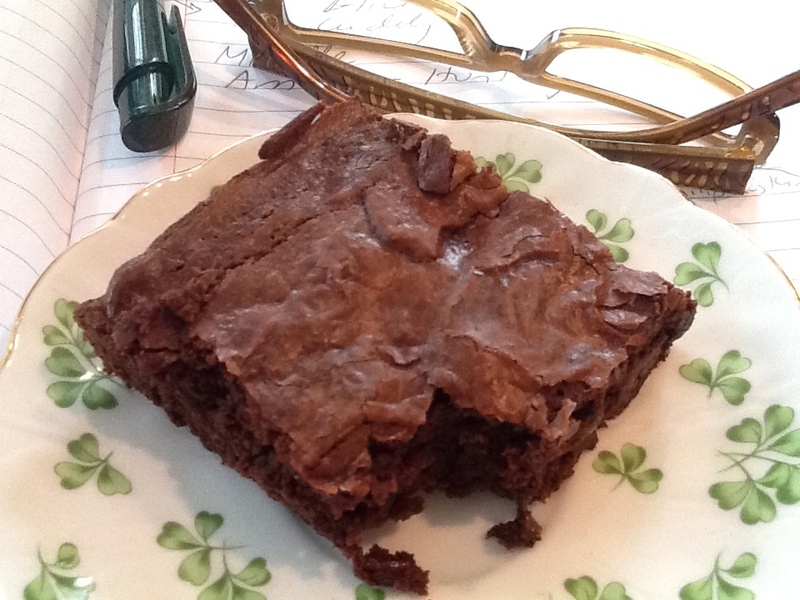 KingArthurFlour.com has one of my favorite all time brownie recipes. It is ridiculously easy. Seriously, skip the box since this takes about the same time, tastes a heck of a lot better and uses REAL butter.